The World Travel & Tourism Council (WTTC) has announced the 12 finalists for the 2009 Tourism for Tomorrow Awards. Under WTTC’s stewardship since 2003, the prestigious Awards recognise best practices in sustainable tourism in four different categories – Destination Stewardship, Conservation, Community Benefit and Global Tourism Business. A record number of entries were received this year from over 40 countries and six continents. Hotel room rates in Dubai have dropped as much as 30% as the global economic downturn sees holidaymakers cut back on spending, tour operators in Dubai have noted. Aloke Dey, the manager of Dubai-based Sharaf Travel Holidays, said fourstars and five star hotels have cut their room rates by between 10 percent and 30 percent, also the Frre night offers are being offerred from begining of the 2009. 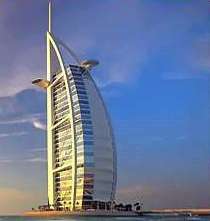 This includes the worlds best hotel in DUbai the burj Al Arab which is offerring 1 free night if you book 2 consequetive nights. Avtar Singh, director of operations at Dubai-based Lama Tours, said room rates had dropped at least 10 percent over all. Mr. Suhail Agha of Exotic DUbai Tours reported that there had been such feeling starting from August the bookings for 2009 are low and due to this the hotel rates are bound to be low. “The hotels will either need to lower the rates or put in more efforts with tour operators to promote Dubai even more in the foreign world” Mr. Suhail Added. Mr. jamal panhwar of Travel & Culture said that the rates were already hyped and a correction was always needed.